Wilsons are thrilled to be recognised again this year for the really great work we do. 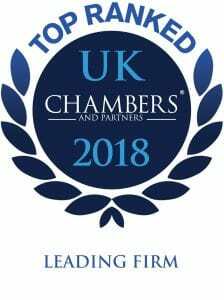 Chambers 2019 have recognised our Children: Public Law Matters, and Immigration: Human Rights, Asylum and Deportation teams. Particular congratulations to Mark Gilmartin and Michelle Flynn who are ranked as individuals in the family department, and Ana Gonzales, Anita Vasisht , Matthew Davies and Michael Hanley who are ranked and recognised as specialists in their field in immigration. We anticipate that the chambers and partners 2019 logo to go live in November.